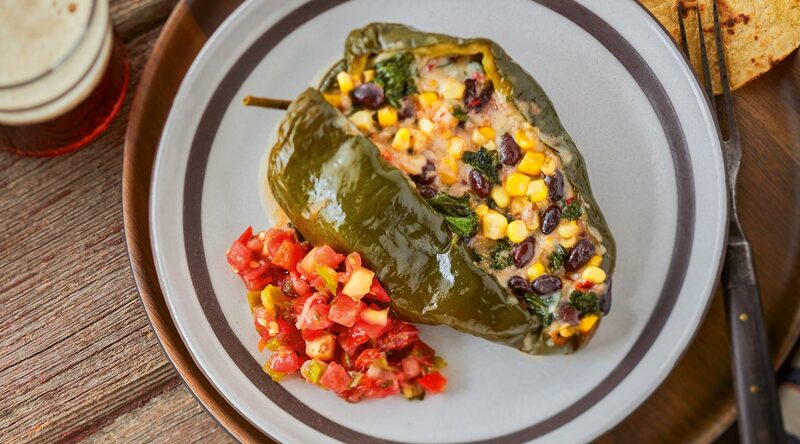 Serve as a meatless dish or side with grilled chicken; these sassy stuffed peppers have a gooey filling with a little spicy bite from the pepper jack cheese. Prefer less spicy heat? Monterey jack cheese is available in several flavors. Look for the Proudly Wisconsin Badge when shopping for cheese. Any brand of Wisconsin Pepper Jack can be used in this recipe. Cut a lengthwise slit down each poblano pepper, leaving the stem intact. (Take care when cutting; avoid slicing peppers through to the opposite side.) Remove seeds. Place 1 pepper onto four greased pieces of double thickness aluminum foil, each about 16 x 12-inches. Combine the pepper jack, black beans, corn and kale in a large bowl. Season with salt and pepper to taste. Stuff a fourth of the pepper jack mixture into each pepper. Fold foil into packets and seal tightly. Grill, covered, over medium-high heat for 18-22 minutes or until peppers are tender. Meanwhile, wrap tortillas in a foil packet and seal tightly; grill for 5 minutes. Remove foil packets from the grill. Let stand for 5 minutes. Take care when opening the foil; allow the steam to escape. Serve stuffed peppers with tortillas and pico de gallo. Cheesemakers Tony and Julie Hook have been making well-loved cheeses for over 45 years. Their pepper jack cheese won third place in its category at the International – 2016 American Cheese Society Competition. Flecked with jalapeños, this monterey jack cheese has a bit of spicy zip.